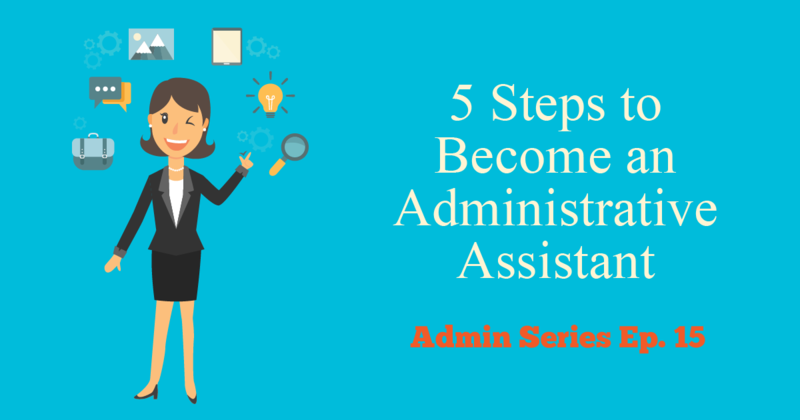 5 Steps to Become an Administrative Assistant | Kevin Smith Group Inc.
An administrative assistant is a clerical worker who performs a wide array of business office support tasks. Conducting research, writing reports, writing letters and other correspondence, organizing incoming correspondence, scheduling appointments and meetings, recording the minutes of meetings and greeting visitors are among your responsibilities. If you’re new or inexperienced, you might have general duties such as filing and bookkeeping. If you have some seniority, you might supervise other clerks. For entry-level positions, a high school diploma or GED is often sufficient. Figures posted online show about 39% of administrative assistants have no more than a high school diploma (www.onetonline.org). If your school offers vocational training courses in computer applications and business office skills, you can begin learning some of the clerical and administrative support tasks you’ll perform. Courses in English can also help by developing your verbal and written communication skills. Certificate and Associate’s degree programs for administrative assistants are available from community and vocational colleges. Programs at both levels train you in office procedures, basic computer maintenance, business productivity applications and business communications. Associate’s degree programs might also cover human resources management, accounting and business law. Certificates may be earned in one year and associate’s degrees in two. The U.S. Bureau of Labor Statistics estimates that more than 3.9 million people were employed as secretaries and administrative assistants in 2014 (www.bls.gov). From 2014-2024, employment is projected to rise by 3 percent. Growth is expected to be fastest in expanding economic sectors, such as healthcare and education. Your potential employers include elementary and secondary schools, colleges, government agencies and financial institutions. As of May 2015, the median annual salary for secretaries and administrative assistants (except those specializing in legal, medical or executives) was $33,910. While certification could improve your professional standing and allow you to negotiate a higher wage, it isn’t mandatory. The Certified Administrative Professional (CAP) from the International Association of Administrative Professionals (IVAA) and the Certified Virtual Assistant (CVA) from the International Virtual Assistants Association are two widely recognized credentials you can obtain after gaining work experience. To earn the CVA, you need to be a member of the IVAA and pass their certification exam. Eligibility for the CAP requires four years of experience if you don’t have a degree or three years of experience if you have an associate’s degree. Organization and planning, records management and communication are among the topics covered in the CAP exam. The knowledge you accumulate about the business operations of your employer provide a strong basis for advancement. You could become an office manager, clerical supervisor or executive secretary. Transitioning into positions as a trainer or instructor of assorted clerical workers or sales rep for computer hardware and software companies are also possibilities. With a high school diploma, you can also pursue a career as a receptionist, general office clerk or bookkeeping clerk, though some employers may require some additional training. Receptionists typically perform similar job duties to administrative assistants, such as scheduling appointments, greeting visitors, maintaining files and answering phone calls. General office clerks may also perform similar clerical duties to administrative assistants, including filing, typing, answering phone calls and creating reports. Bookkeeping clerks are responsible for creating financial statements and reports, as well as managing files and transactions. Thank you for reading today’s blog on the Administrative Professional industry. Please visit us every week as we continue to publish tips, industry news and strategies that directly impact every Administrative Professional.